blogs kept on putting up the former richest musicians in Nigeria without editing their post and putting up the new rich kids on the block. 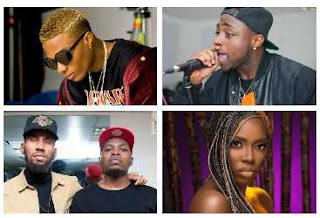 In this post I will list the current Top 10 richest musicians in Nigeria this year based on their performance last year. These musicians on my list enjoyed all these and more last year,in fact one of these musicians filled up a stadium at a show,while the other bought one of the latest Bentley SUV's,anyway before I digress,here are the current top 10 current richest musicians in Nigeria in no particular order. Don Jazzy is not a newbie when it comes to being on the richest musician list,the boss of Mavin Records,is still definitely one of the richest and bankable musician in Nigeria. In 2017 he made the forbes list with Wizkid and Davido as some of the richest musicians in Africa. I didn't see much entertainment from Don Jazzy last year,but you must be certain he made some money from projecting some of his artists like Tiwa Savage,Reekado Banks,Koredo Bello Etc apart from that Don Baba J also enjoys lucrative endorsement deals from Loya Milk,MTN Etc which is estimated to be worth millions. David Adedeji Adeleke popularly known as Davido is currently one of the richest musicians in the Nigerian music industry right now. Davido has been having a great year,all his songs has been topping the charts,and steady winning awards,he also has been enjoying endorsement deals worth millions of Naira. His 30 billion concert show gross hundreds of millions of Naira,infact according to Davido,he made half a million from his 30 billion concert shows,Davido is definitely one of the richest musician in Nigeria. Davido is also the CEO of DMW,his own music label,he also makes money off some the artists signed under his record label. Wizkid is said to be one of the richest and bankable musician in Nigeria and also one of the richest according to forbes,his endorsement deals with Glo,Pepsi,Sony Music deal and recently a football jersey endorsement are estimated to be worth millions of Naira. A lot of people might be surprised that Tekno made the list but the fact is that Tekno made a lot of money last year. His songs was a hit back to back from " Diana" "Tender" "Rara" to "Pana",he really dished out some good music. Tekno is holding down the 4th position this year. Folarin Falana, popularly known as Falz The Bahd Guy,is rated as one of the richest musician in Nigeria today. Although he is still young,he has carved a niche for himself as one of the richest young rappers in Nigeria. The talented rapper/lawyer is currently signed to Bahd Guy Records & X3M Music,his first show the Falz Experience concert which held at Eko hotel and suites racked in millions of Naira and was rated as one of the most organized shows back in 2017. Tiwa Savage has been consistently holding it down for the female folks in the Nigerian music industry. Tiwa has a couple of endorsement deals worth millions of Naira such as MTN,Maggi, Forte Oil and Pepsi deals. She is currently signed to Mavin Records and is said to be the richest female artiste in Nigeria. Phyno made rapping in Igbo look cool,he definitely has some of the most loyal fans in Nigeria. His show "Phyno Fest" set a new record,as the whole stadium was filled up. The songwriter, rapper, and record producer is rated as one of the richest musician in Nigeria currently. If you ask me,I will tell you that Olamide is one of the most consistent musician in Nigeria and will still be relevant in many years to come just like 2 Face. Olamide is one of the best and richest musician in Nigeria,his consistency and ability to release hit tracks effortlessly is enviable,Olamide has numerous endorsement deals,his show Olamide Live in Concert (OLIC) was one of the most attended concerts in Nigeria. Mr Eazi,whose real name is Oluwatosin Oluwole Ajibade. Mr Eazi is a Nigerian singer, songwriter, and the self acclaimed pioneer of Banku Music, a fusion sound that he is promoting. Mr Eazi made money from his "Life Is Eazi UK Tour",he is also currently dating Femi Otedola,the daughter of one of Nigeria’s richest men. Mr Eazi is definitely one of the richest musician in Nigeria,let's hope he lives up to our expectations this year. Run Town is a Nigerian singer,songwriter,recording artiste, stage performer and record producer. The musician whose real name is Jack Agu started his musical career professionally in 2007,ever since he has carved a niche for himself as one of the richest musician in Nigeria. After releasing the hit single Gallardo,he has continued to impress us with his style of music. He had some massive collaborations last year that was impressive. Listed above is the list of the current top 10 richest musicians in Nigeria based on their performance last year,do you agree or disagree with this list? Let us hear what you think in the comment section below.